Does God Ever Speak to Us? The above picture is one of my all time favorite memes. I can’t recall where I came across it (I suspect Facebook). Why do I like it so much? It captures the essence of how God communicates to us… through His Word, the Bible. So… Does God ever speak to us? Elihu says in Job 33:14, “For God speaks time and again, but a person may not notice it.” Elihu says something quite profound. Not only has God clearly spoken to man regarding His wrath, which is “revealed from heaven,” but we have all ignored or “suppressed” such speaking. So, how does God speak to us? Everyone sees His glory through what He has made. Such is the type of speaking I’m talking about. When one sees a sunset or the flash of a lightening bug on warm summer night, God is revealing Himself. God is heard. It is through both the creation and the Bible, by which we hear from God. The creation speaks about His existence and it hints at His wrath. It’s clear that by just looking around, it is blatantly obvious that we are not an accident and that something has gone terribly wrong. 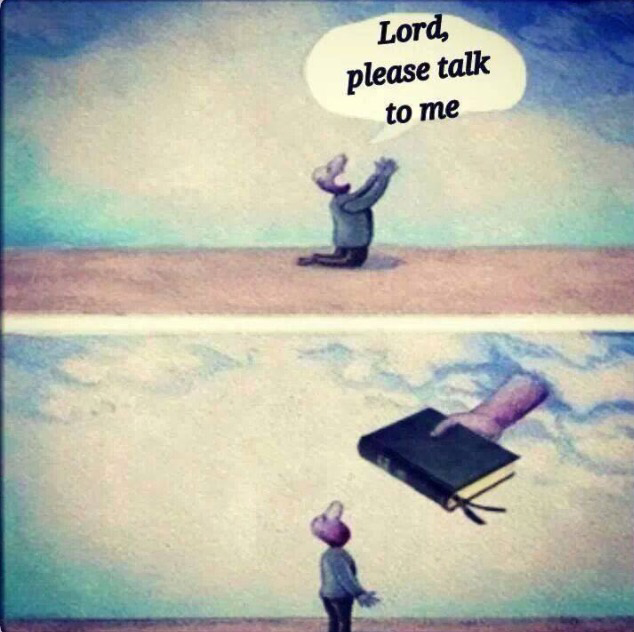 Just as in the meme above, we all crave and plead to hear from our Creator. However, we want to hear from God as that unbeliever had challenged me. We demand that God speaks to us… directly… on our terms… and not on His. How many days must Your servant wait? When will You execute judgment on my persecutors? but I did not abandon Your precepts. and I will obey the decree You have spoken. The following was also posted in your OP the “The Lions Den Deliberation Group” FB page. I believe God speaks to us today in different forms and ways, including an audible voice. The intent of the Cross was not ultimately to forgive sins nor was it to give us the Bible, both which are the means to the goal; but fellowship with God is the goal; that is, that is, the experience of the immediate Presence of God. Why would you think that God now speaks audibly, since scripture doesn’t hint at such? what of those who cannot read, or see? God does speak although consistent with scripture, he is not confined to speaking through the bible only. He does not fit in a theological box. Romans 1 says that everyone knows He exists and that they’ve violated His purpose by the default of being part of the creation. That’s “general revelation.” But, salvific information, the Gospel, or “special revelation,” must be shared with them. Ultimately, special revelation comes from scripture. Such a person could read scripture in braille, or be read to. I haven’t looked into it, but I’m under the impression that Hellen Keller, who was both blind and deaf, was a believer in Christ.